In the present paper, the finite deformations of a laminated inhomogeneous spherical shell are studied. A laminated shell can be considered as a limit case for multilayered shells when the thickness of each layer tends to zero while their quantity tends to infinity. Such a limit might be useful in modeling of multilayered structures with large amount of layers, for example, produced by layer-by-layer additive manufacturing. It is easy to explain the nature of inhomogeneity for multilayered structures (discrete inhomogeneity). It is just the result of the fact that in the stress-free state the shapes of layers do not fit to each other. Thus, they cannot be assembled without gaps or overlaps. Proper assembly becomes possible only after individual deformations of layers that cause self-equilibrated stresses in their assembly. The explanation of inhomogeneity for laminated structures (continuous inhomogeneity) is slightly more complicated. It can be given upon the idea of a continuous family of reference shapes that are free from stresses only locally. In the present paper, this approach is discussed in detail. To define measures for stresses and strains on laminated structures, one has to determine corresponding fields in some specific way. Such definitions that are obtained by formalism, adopted in the theory of smooth manifolds with non-Euclidean connection, are also given. To compare a discrete inhomogeneity with its continuous counterpart, the stress–strain states for the sequence of multilayered structures have been examined. The common factor of these structures is that they have equal final volume. Meanwhile, the number of layers increases with their order in the sequence. The measure for inhomogeneity related with non-Euclidean connection is found from a nonlinear evolutionary problem. 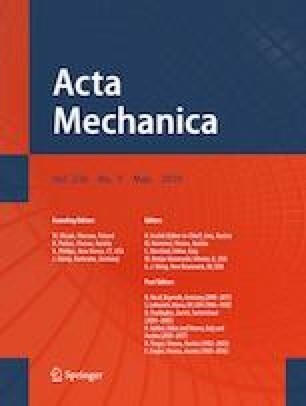 To support improved understanding of the interplay between multilayered and laminated structures, the stresses and strains exerted in them are studied in comparison. Considerations of the reverse situation, in which some multilayered structure with discrete inhomogeneity is defined upon a given laminated structure, are also carried out. The convergence with decreasing maximal thickness for layers to the original laminated structure is illustrated numerically. In this, one can see similarity with the partitioning procedure in the theory of integrals. The online version of this article ( https://doi.org/10.1007/s00707-019-02399-7) contains supplementary material, which is available to authorized users. The work was performed with partial financial support from the RFBR No. 18-08-01346, RFBR No. 18-29-03228 and FASO (Project No. AAAA-A17-117021310373-3).